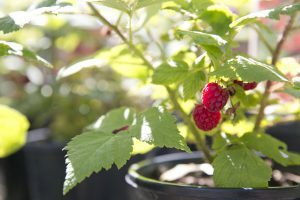 Whether you are a seasoned forager, or just enjoy growing different edible plants in your own backyard, there is a myriad of choices of edible shrubs to choose from in Northern Alberta. I have my own favorites, and there are some newer choices out there for the discerning gardener, but the selection of varied species available to us never ceases to amaze me, even if I find there are far too many choices to fit into my own garden plot. We are lucky, and you will likely agree once you browse through the few samples that I am about to explain. My favorite is the blueberry and they are actually native to northern Alberta. You can choose between low bush and high bush varieties, depending on your growing area, however if I had to choose one, I would choose a hybrid of the two, which grows to about 3′ tall and produces bountiful numbers of bright blue berries. As George Carlin always liked to remind us “blueberries, blue on the bush, purple in the pie”. Low bush varieties produce small fruit and tolerate Alberta winters well. High bush will produce larger berries and produce many more, yet these bushes are not as hardy and may fall victim to winterkill. One thing is true of all the varieties of blueberries, and that is the fact that they love acidic soil. For detailed information please see Blueberries 101. High bush cranberries are lovely plants and can even be used as a hedge, as they grow so tall. Although not a true cranberry, these are also native to Alberta and produce wonderful tasting fruit (once cooked into jelly). They are frost tolerant and prefer sun or part shade. These tall bushes also produce a beautiful show of white flowers in the spring. The fruit starts off as green, slowly turns yellow/orange and then gets streaks of red until late into the year, the entire fruit becomes completely red. Raspberries seem to grow everywhere and anywhere, and Alberta is no exception. Most children love to avoid the prickles while enjoying a feast of handpicked raspberries on a hot summer day. Whether red, yellow, orange or purple, they are all sure to please and they really don’t require much care to thrive (although the deep purple are by far, my choice). Prune out the dead canes yearly and your raspberries will thrill the kids and adults alike for many years. Saskatoon berries have been growing in Alberta since before man discovered them. In fact, most Canadians don’t even know about these delicious and hardy berries, as they are not widely available in many provinces east of us. Saskatoon bushes can also serve as a tall hedge once established and can grow to 15′ tall. These antioxidant rich berries resemble blueberries in colour and size, and do extremely well as either jam or in a pie. The taste is similar to a blueberry with a hint of wildness. Haskap berries are quite new to the scene in Alberta, yet grow exceeding well in our climate. I am also told that deer do not seem to like them, so you are more likely to be able to keep what grows. Although I do not have direct experience with these bushes, I have purchased a number of them this year for my yard, with high expectations of success. They are said to have a flavor that is reminiscent of a blueberry raspberry mixture and are extremely tolerant of harsh winters. The 2 types that I am trying this year are Tundra and Borealis, which should produce berries in late June and July. I can’t wait. Goji Berries are another of the newest varieties of berries to choose from. The health benefits from incorporating these berries into your diet seem to be almost endless. I won’t be trying these however, as people on blood thinners or diabetics (which I am) can have adverse reactions to them. If you are lucky enough to already be healthy though, these might give you the antioxidant boost you’ve been looking for. The berries are said to have a sweetness to them with an herblike aftertaste and can be incorporated into your diet via smoothies, trail mixes, added to salads, or just eaten raw. If you are already a fan of this superfood, you know how expensive they are to buy in the store. They are also packed with fibre, fat-free and low in calories. Grow some this year and save yourself a lot of money, and enjoy them fresh off the shrub.